We are engaged in manufacturing Wooden Sleepers, which are made using good quality wood. These are available with us in various sizes and designs as per the specific requirements of our customers. Moreover, we can also provide these in customized sizes and as per the specifications detailed by our clients. uyzWe are at our place one of the emerging supplier of Railway Wooden Sleepers. Railway Wooden Sleepers of AROEIRA Wood, available to export from Brazil, interested Importers may contact for further details. Riding on unfathomable volumes of industrial expertise, we are engaged in manufacturing a broad assortment of Wooden Sleeper. 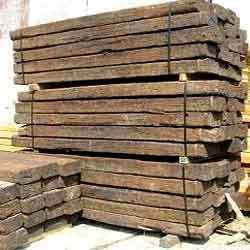 We are able to offer Railway Wooden Sleepers. Due to the support of diligent team, we offer an extensive series of Old Sleeper Wood. IN ANY MATTERIAL OF JUNGLE WOOD.